The LATEST RELEASE!! RING is juicy, it is deep and sweet as it takes you on a bit of a journey. The theme of the retreat last summer was four directions (East, South, West, North) so you might find yourself being carried a full circle on the sound waves of the Ring. ​Though a few tracks were remixed, this music was composed during the retreat and at times spontaneously created during yoga classes. 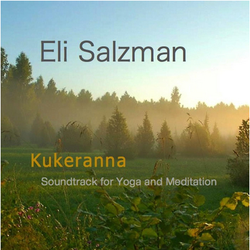 Created from music performed live during a yoga retreat of summer 2015, this soundtrack is ideal for accompanying a yoga session at home or in the studio, and also perfect for meditation and simple enjoyment. Some of it prepared in advance, much of it happening spontaneously using loops and sequencers on the fly, it was born out of collaboration with the yogis on the retreat. PS! A bigger percentage goes to the musician if you buy from Bandcamp or CD baby!